Our Expert on East Hill and Beach-Waterfront Properties. Chris first visited Pensacola with her husband Rob over 20 years ago, vacationing, fishing and spending time with family friends. Over the years, as vacations became more frequent and longer, Pensacola started to feel like home. Chris and Rob moved to Pensacola full-time from New England in 2007. Before that, Chris attended the School of Visual Arts in New York City and interned in the graphic arts department of NBC's Saturday Night Live. She received a degree from Boston University's College of Communication in 1990 while simultaneously working as a photographer for the Quincy Patriot Ledger and the Westfield Evening News. She went on to become the Associate Director of Aurora & Quanta Productions, an internationally recognized photography agency, known for representing a stable of National Geographic Magazine photographers, with sub-agencies throughout the world. She was a fine art teacher for six years at the private school Hebron Academy, teaching architectural design, photography, painting and drawing while also actively working as an independent freelance artist. Her artwork has earned awards in numerous national juried shows, and can be found in private exhibits and collections nationwide. Her experience and understanding of architectural design, construction, public relations and customer service have served her clients well in the world of real estate. Chris has been recognized by the National Trust for Historic Preservation as a member of the ERA Historic Properties program. She is a recipient of ERA's National Recognition for Achievements "Beyond Excellence" 2010 & 2011, and "Circle of Achievement" 2012 - 2015, “Leaders’ Circle” 2016, and is Emerald Coast Realty's Top Producing agent for 2010 & 2012 – 2016 with OVER $50 MILLION IN SOLD PROPERTIES! Chris has specialized as a real estate professional, Realtor in Pensacola's historic downtown neighborhoods and waterfront properties across the panhandle. She is an advocate for the revitalization of Pensacola and treasures, the area's natural environment. 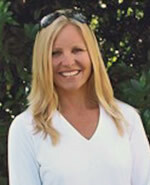 As a water girl, she enjoys spending time at the beach, offshore fishing, fly fishing and surfing.